All the wireless networks are encrypted using WEP or WPA/WPA2 keys. To hack into a wireless network you need to find the security key. The following tutorial will deal with cracking the WPA/WPA2 security key. This tutorial is only for educational purpose, I'm not responsible for your bad deeds. 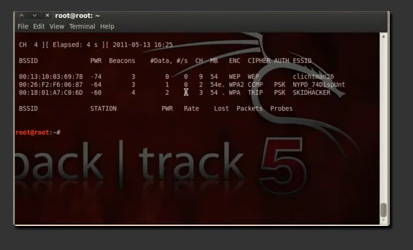 Hacking WEP Wireless Network using backtrack. 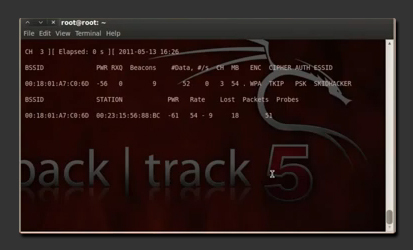 Hacking WEP Wireless Network using FERN WIFI Cracker(GUI). Hacking WEP Wireless Netwok Without Using Dictionary. 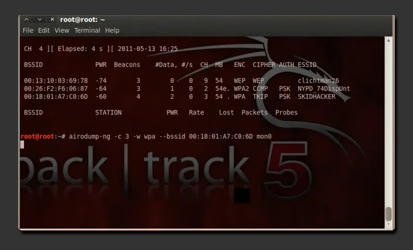 backtrack 5 GNOME or previous versions (which can be easily downloaded from its official site) and a compatible wireless card that supports packet injection. Okay, so firstly open up a terminal and once we have the terminal open we are going to type in airmon-ng which will display our wireless interfaces. In my case I have wlan0, and now we are going to put it into monitor mode. To do that, type airmon-ng start wlan0. As you can see on the picture below it says (monitor mode enabled on mon0), and we are going to be using mon0 instead of wlan0 as our interface. 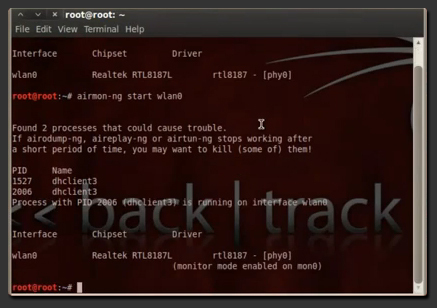 Lets type in airodump-ng mon0 and this command is going to initiate the scanning process for Wi-Fi networks. As you can see in the picture below, a few WPA encrypted networks should pop up. I'm going to attempt to crack the network under the essid SKIDHАCKER. Take a note of the channel, and you want to copy the BSSID for later use. Now we are going to type in airodump-ng -c (channel) -w (filename) --bssid (bssid) mon0, and replace the values to fit what you got from the last step. Don't forget to remember what filename you chose, because we are going to need that at the end. 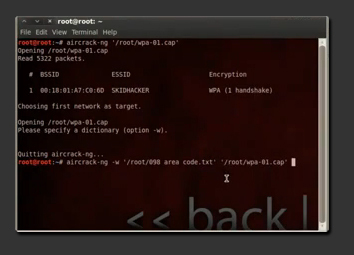 What is needed to crack a WPA or WPA2 key is something called a WPA Handshake. You can obtain a handshake by kicking someone off the network, and those computers will automatically reconnect which will give you the handshake. This means, if there is no one on the network, you can't get a handshake, and you can't crack the WPA network. So how do we know if someone is connected? Well look at the lower part of the airodump command, and you will notice something as STATION, and underneath that if someone is connected it wil show you their mac address. Once you get a handshake, airodump will alert you in the top screen, and the handshake will be located right from the time stamp. Okay, so lets open up a new terminal and we are going to kick off the computers connected. Lets type in aireplay-ng -1 0 -a (bssid) mon0. replace bssid with the network you are trying to crack and hit enter. It is going to attempt to kick off a client, and if it succeeds you will see the wpa handshake at the top right corner, if you don't run the aireplay command a couple of times. So now that we have a wpa handshake file, we are going to attempt to crack it. Lets stop the scan by pressing CONTROL + C on the terminal where airodump is running. Now in order to find the handshake file, you need to go in the top menu and chose Places > Home Folder. Okay, so lets open up a terminal and we are going to type in aircrack-ng -w (dictionary) /root/(filename). Where filename is the filename you specified when capturing the wpa handshake and the dictionary is the path of the wordlist you downloaded. This can be done by dragging in the handshake file into the terminal after the aircrack-ng -w (dictionary) command and it will parse in it's directory. All you need to do is hit enter. The password needs to be in the dictionary file, so the bigger the wordlist is the bigger are the chances of you getting the password. If the password is in the wordlist, it will give you a success message. That means your wireless card is not supported.. You may use any other external wireless card(a supported one) that are easily available on ebay. nicely explained, and it works as now I'm using my neighbours connection. Is it against the law? It depends upon the country you reside in. i am trying to crack wpa/wep wireless network .The following message was displayed . This tutorial is for cracking wpa wireless network. 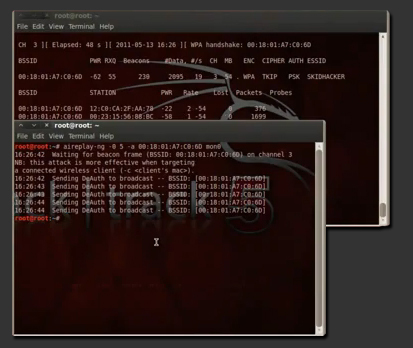 First make sure which network are you trying to crack WPA or WEP? the size of the file for wordlist is like 3-20GB, it's not possible to find such a wordlist any file sharing site. Torrent is the only option. when i type airodump-ng mono0 i get this message "failed: No such device" is there anything am not doing right. Help!! The 0 and the 5 are the number of times you want the command to be ran. diference is that in aireplay-ng -1 0 -a (bssid) command machine try to deauth. with large attemtp, they not stop until ctrl+c command is given and in secound command aireplay-ng -1 5 -a (bssid) number 5 is number of atempt for deaut. So just 5 times.